I’ve finally fully moved myself over to the self-hosted site I purchased about 2 months ago. There’s still a lot of work to be done on it, but it’ll have to do for now. I do realize it’s a big pain in the arse if you subscribe to my blog via email or WordPress, but I hope that you take the time to subscribe via RSS or email on my new site. 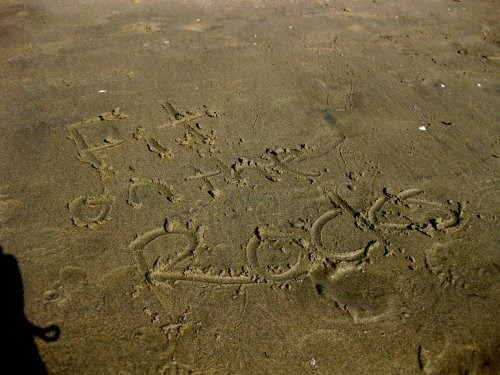 Thanks for reading while I blogged on here; it really means a lot to me, so I’ll (hopefully) see you on the flip side! I clearly ate a lot while I was in So Cal over my extended weekend, but there’s definitely more where that all came from. I didn’t photograph any of this stuff, but I picked up a Mango Chicken cold noodle dish, some dried mangos, pumpkin butter, and wasabi flavored almonds. From good ol’ Micky D’s we got their new chicken bites and an order of fries. It was glorious. 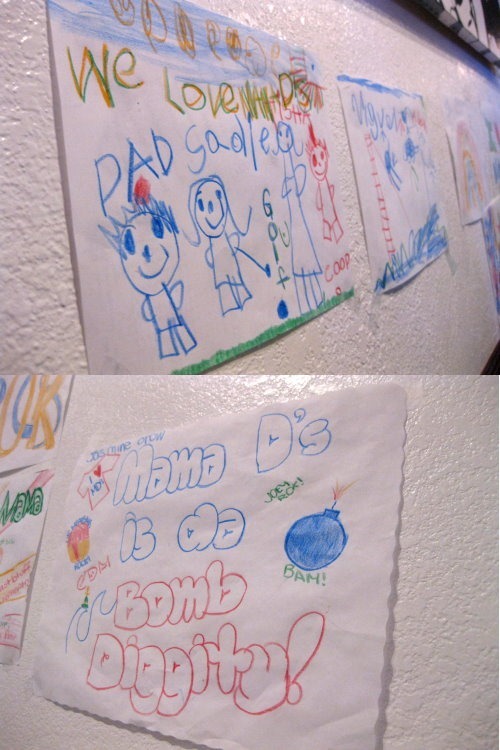 We showered, lounged around, and then said our goodbyes. 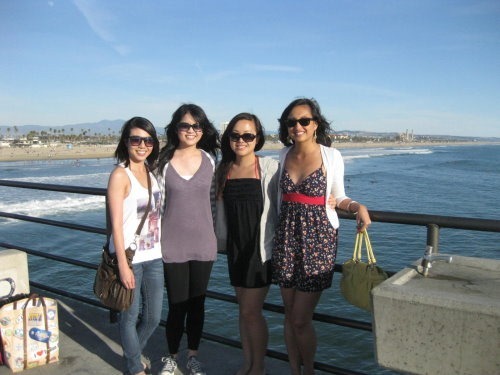 Kim had to head back down to San Diego and Ngoc headed out to watch the Super Bowl. 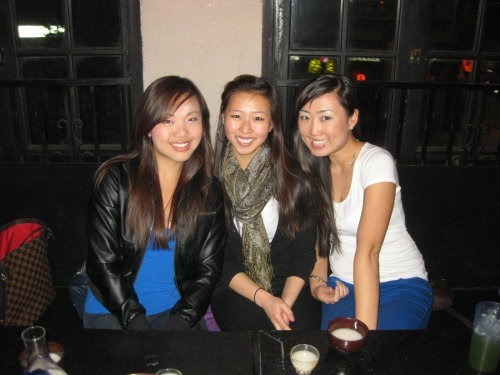 Jennifer, Joyce, and I were headed up to L.A. to meet my aunt, uncle and cousins for dinner at Park’s BBQ in Koreatown. Park’s BBQ is a popular Korean bbq restaurant, which they make evident with the photos of famous people dining there. My uncle put in several orders of beef (didn’t pay attention to which cut he ordered) and their house specialty beef rib meat. I was pretty freakin hungry by this point, so I only took a picture of the latter end of our meal. 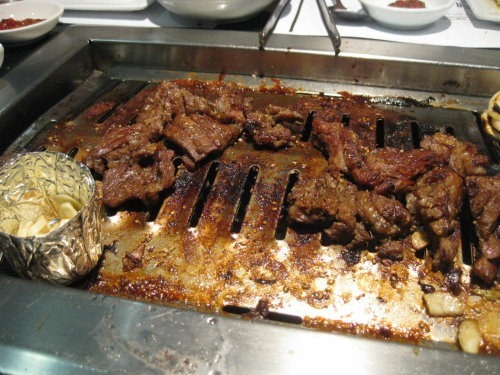 If you’ve never done Korean bbq, you order raw meats that you or the server cooks on a special grill that is built into your table. The meats are served with a variety of Korean side dishes and are wrapped using either lettuce + rice or thin-cut rice cake sheets. To round out the meal, he also ordered their 된장 찌개 (doenjang jjigae- fermented bean paste stew) and 김치 찌개(kimchi jjigae- kimchi stew). 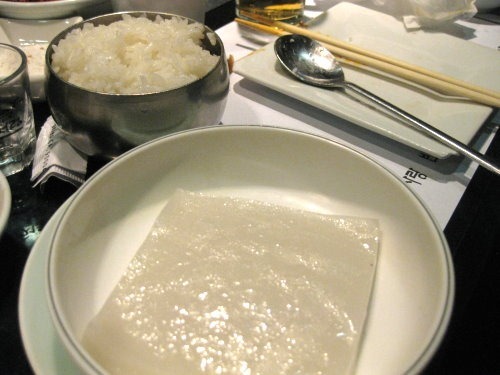 This is the bean paste soup. Joyce and I got up early to take Jennifer to work and do some last-minute things before I had to take Joyce to the airport. 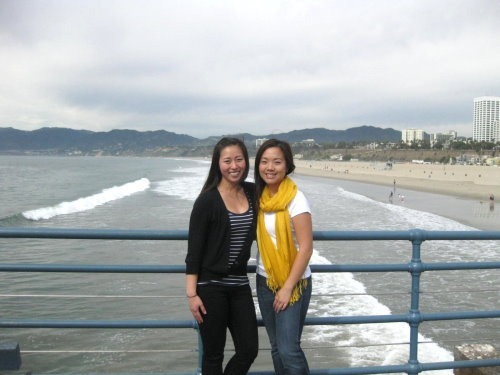 On the agenda: shopping at 3rd Street Promenade, day drinking on Santa Monica Pier, and more Korean food in K-Town. Shopping proved to be a rather big failure because we were both feeling bloated from the weekend of major eating, so we ended up doing some quality eye-shopping instead. Afterwards, we walked onto the Pier and grabbed a table at Mariasol Mexican Restaurant, located on the furthest end of the Pier just over the ocean. 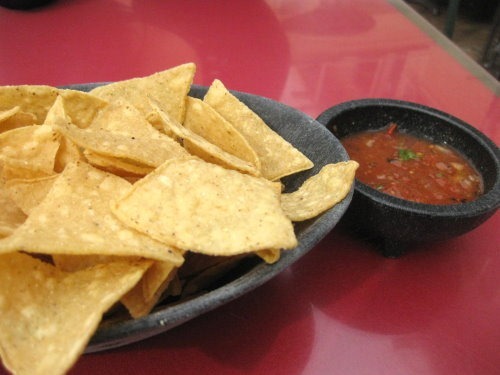 We each ordered a sangria and munched on chips and salsa. This is precisely when I realized I had lost my cell phone. Joyce’s cell phone had already died, so we had no other choice but to walk around looking for it. We chugged our sangrias, speedily paid our tab, and speed-walked back to the Promenade where we had it narrowed down to three stores. 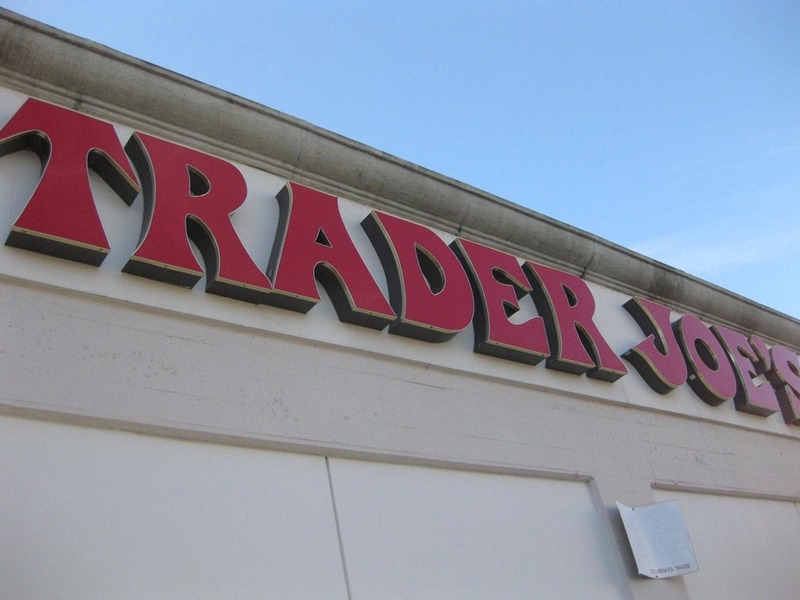 Luckily, it was at the first store we checked. Apparently, running a half marathon killed whatever extra brain cells I had left. 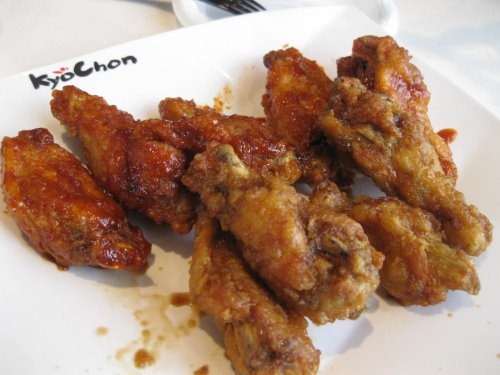 We decided that was enough of Santa Monica and headed back to Koreatown to hit up KyoChon chicken. They’re known for their crispy, hot chicken wings. They took forever to come out and were just okay. I will give them credit though because the hot and spicy wings were actually hot. Joyce’s lips were on fire for a good 30 minutes. 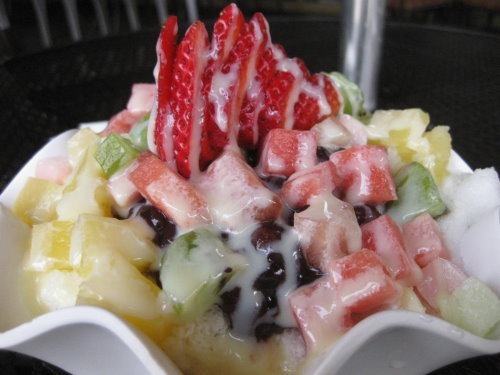 To cool down, we walked across the street to Haus Dessert Boutique for some 팥빙수 (pat bing soo), which is a Korean shaved ice dessert. I’ve had way better shaved ice at other places in L.A., so we were both rather disappointed, but at least it looked pretty! After making a quick stop at Paris Baguette, a Korean bakery, for some yummy pastries, we ended up at the Koreatown Galleria’s food court. Joyce had a major hankering for Korean street food, and we didn’t know where else to go. We picked a place called Cham Cham Cham and ended up with a feast. 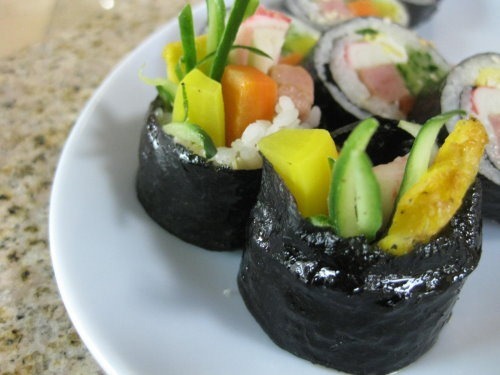 We got the 김밥 (kimbap), which resembles a Korean “sushi” roll. Generally speaking, all of the ingredients are always fully cooked and usually include various veggies, fried egg, and a meat. Ours were made with SPAM. 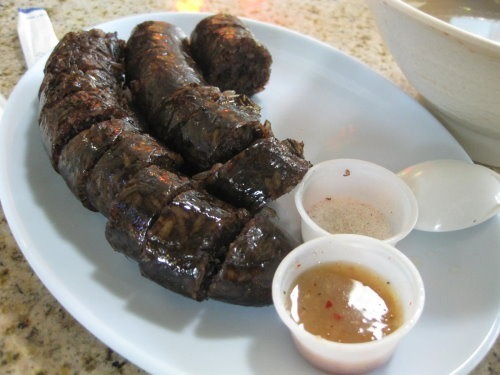 Then we got 순대 (soondae) aka blood sausage. If unusual animal parts freak you out, you would probably be better off not knowing what this is made of. It’s pig intestines stuffed with noodles and dried blood. As a kid, I didn’t know what was inside and loved it. When I found out, I nearly vomited, decided that I had already eaten a gazillion of these and loved them, so I continued eating them. They truly are tasty and variations of it are eaten in cultures all over the world. We finished off with 오댕국 (odeng gook), a fish cake soup. It’s a light broth filled with fish cakes and veggies, and Joyce had been craving it all weekend long. I somehow forgot to take a picture, so here’s a generic photo. Soon it was time to take Joyce to the airport so that I could pick up Jennifer from work. I wasn’t all that hungry for a full dinner, so Jennifer and I went to get mani/pedis. 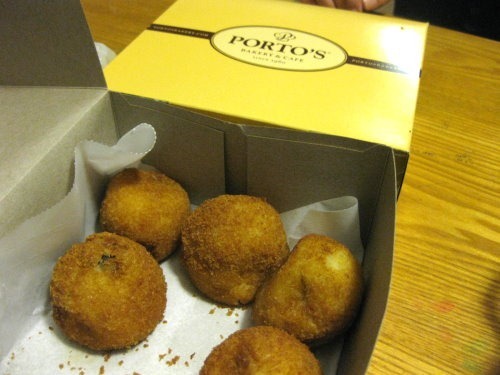 Even after that, we weren’t starving, but I really wanted Porto’s potato balls again….real bad. So, we went. It was glorious! I’m kind of glad we don’t have a Porto’s in Denver because I would get so fat. They’re only 70 cents each! I would literally eat them every single day. Like I said, good thing they’re not here. 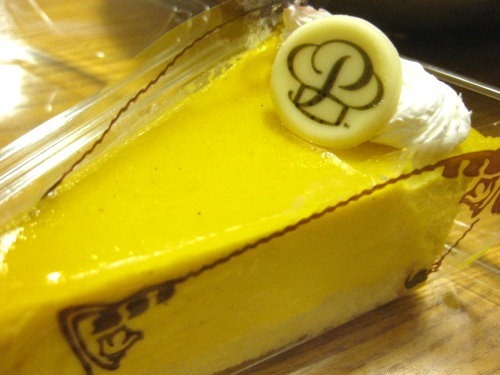 I also got their mango cheesecake, which was absolutely phenomenal and not too sweet. Last day in sunny gloomy California 😦 I had my last breakfast with Jennifer’s family before heading out for the day. I drove up to the UCLA area to chill out at a coffee shop before meeting Kris for lunch. She suggested we go to 800 Degrees Neapolitan Pizza, and I’m so glad we went! 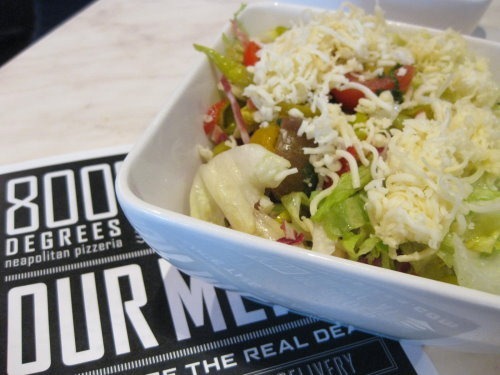 We started off with their chopped salad of assorted vegetables, cheese and meats in a red wine vinaigrette. So yummy. For the pizza, you start with fresh dough and then choose everything that you want to put on your pizza before they cook it in a wood-burning oven. We started with the Margherita base of crushed tomato, fresh mozzarella, parmigiano reggiano, olive oil, and basil. 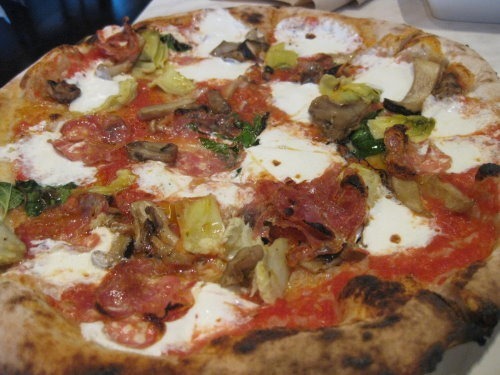 To that we added salami, artichokes, and mushrooms. It was fantastic and just enough food for the two of us. Before we knew it, Kris had to get back to work, and I had some more time to kill before I had to drop my rental off at the airport. I headed to Massage Therapy Center for an hour-long relaxation break, and I’m so glad I did. I got there early, so I made use of their steam room and showered before settling in for an hour of bliss. It was the perfect ending to a perfect trip. It was awful leaving 70 degrees and coming home to 15 degrees. Talk about temperature shock lol. Question of the Day: What’s the most unusual food that you’ve eaten? Thank you all for the congratulations! I’m so happy to have my first race under my belt, and I’m ready to take on more. I wouldn’t say I’m quite addicted to racing yet because this half was definitely tough, so we’ll see what happens after my next 2 races. I have a full recap in the works, so here’s an eating post in the meantime. I ate very well while I was out here in the land of sunshine and highways. I made my way all over Southern California for the race, to meet up with friends, and lounge. Jennifer was a doll and let me put the miles on her vehicle for most of the trip until I picked up Jelly Bean from the rental place yesterday. 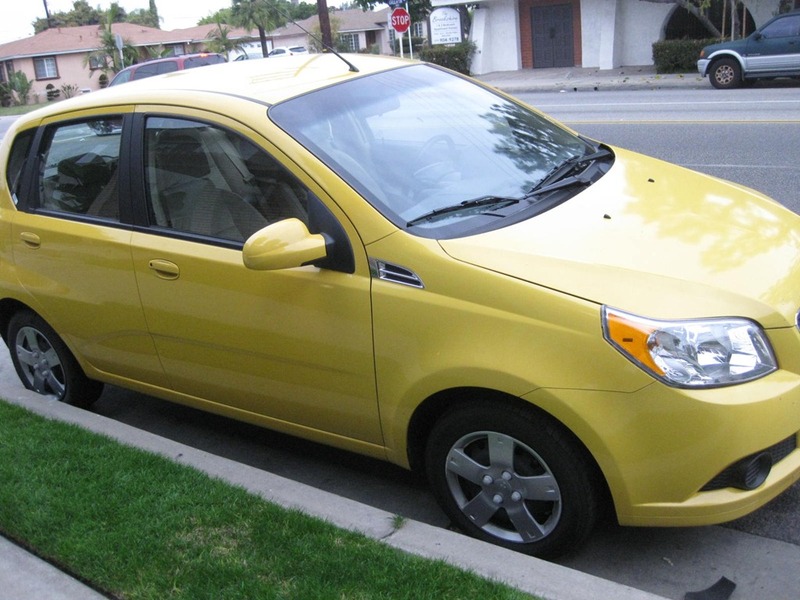 Say hello to Jelly Bean aka Bumble Bee. Anyway, every single morning, Jennifer’s awesome mom made us a traditional Korean meal. Korean people don’t generally eat super “breakfasty” foods. It’s more like what you would eat any other time of day, which consists of rice, a soup/stew, and side dishes. Her family doesn’t really eat dinner, and I can totally understand why. After eating one of her mom’s breakfasts and lunch out, I’m completely stuffed pretty much well into the night. I didn’t take pictures because I didn’t want her parentals to think I was really weird, but you can take my word for how good it was. We picked up Joyce from the airport after Jennifer got off of work on Friday, and we headed to Koreatown for some drinking and food. We went to Gaam, which is a Korean lounge with lots of food, good drinks, and interesting people watching (I might only find it interesting because I’m never surrounded by so many Korean people when I’m in Denver). We ordered a few rounds of yogurt soju (soju mixed with Korean-style yogurty beverage) and makkoli (a milky Korean rice wine). 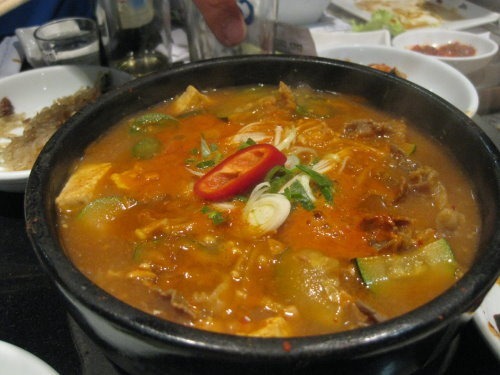 Once our appetites kicked in, we ordered their spicy chicken wings and 부대찌개 (budae jjigae). 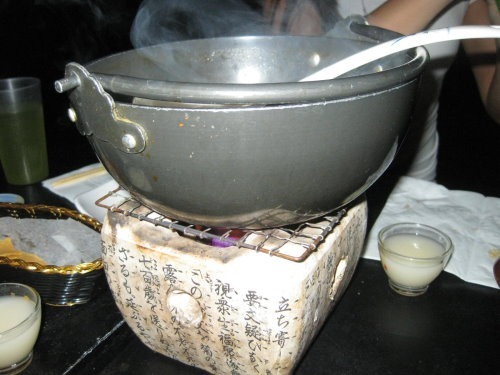 Budae jjigage literally translates to “army base stew” because food was scarce during the Korean War, so families would take ingredients that was in surplus around the American army bases to make soup. You can pretty much put whatever in there, but it always has ramen noodles, veggies, and sausages and/or SPAM. It’s a good drinking food, and was promptly inhaled. 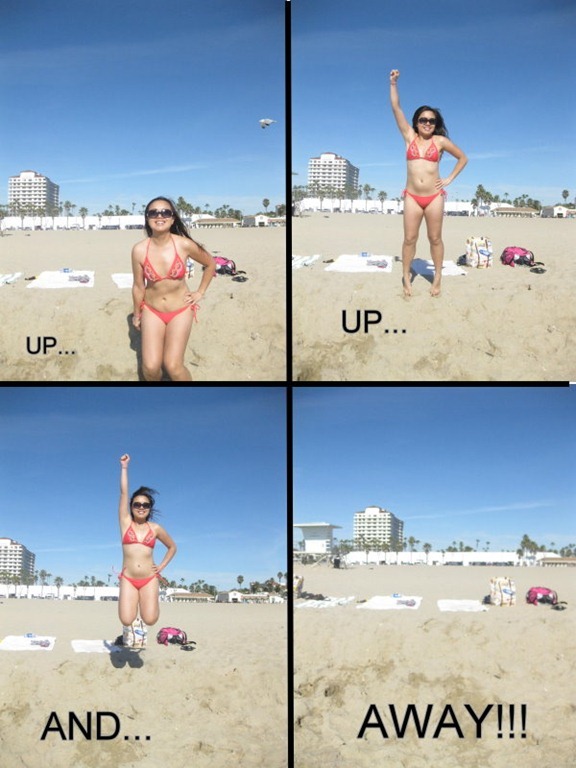 It was a bit chilly when the wind was blowing at Huntington Beach, but we had a grand ol time playing in the sand and sun. 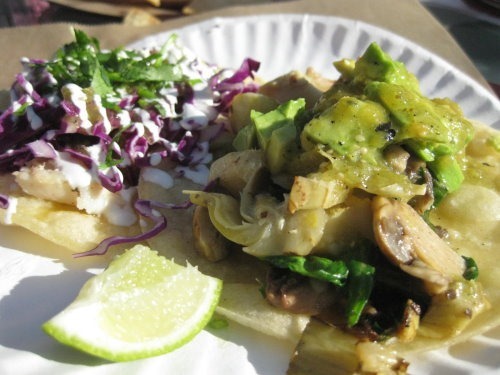 All that Superman business got us hungry, so we headed out to Sancho’s Tacos for, well, tacos. I got a grilled fish taco and a vegetable taco. 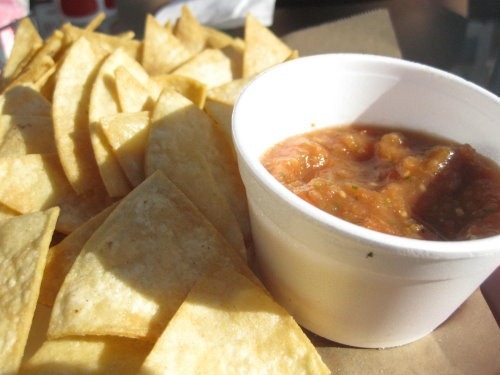 Along with a side of their fresh-made tortilla chips and salsa. The fish taco was absolutely amazing, but the veggies was meh. It was way too soggy and lacking in flavor. Joyce said her carnitas taco was the best, so I wish I had gotten one of those instead. Next time. Shortly after we finished eating, we met up with Ngoc, Kim, and Kris. We all stayed at Ngoc’s apartment that night (minus Kris) since she lives a short ten-minute drive from the start line. Kris had to meet up with her family for dinner, so we hung out on the Pier for a bit before we parted ways. We arrived at the apartment so that we could wash off the beach funk and head to eat some major carbs at Mama D’s in Newport. The line at this place is no joke. We ended up having to wait two hours to get a table, so we went to the brewery next door for a beer. The staff at the restaurant was extremely friendly when we wandered back over and were offering bread and bites of appetizers while we waited. When we finally got our table, we ordered immediately because it was already about 9pm at this point. 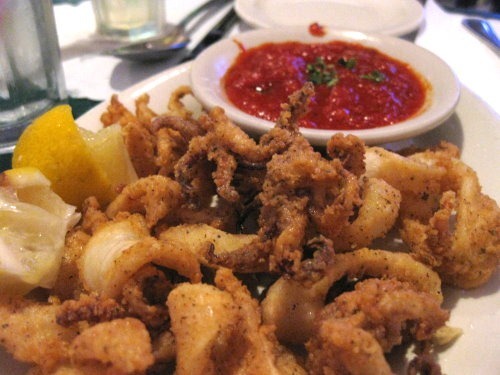 We started off with calamari, which was fried just right and without too much breading. Served with a side of their marinara sauce. 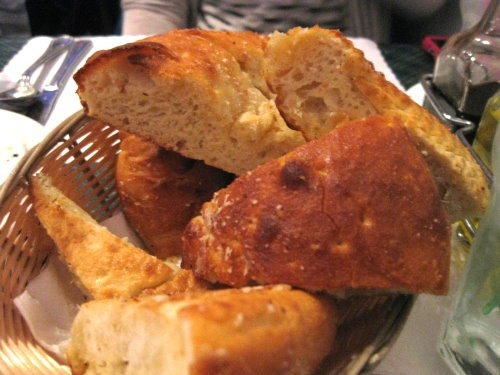 And more bread. Show me the carbs! Their portions were huge, so we split three entrees among the five of us. 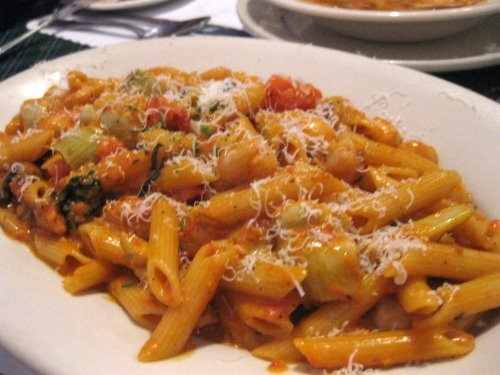 First up was their Roma pasta with their special pink sauce, extra artichokes and baby scallops. Holy yum…this was my favorite dish of the night. 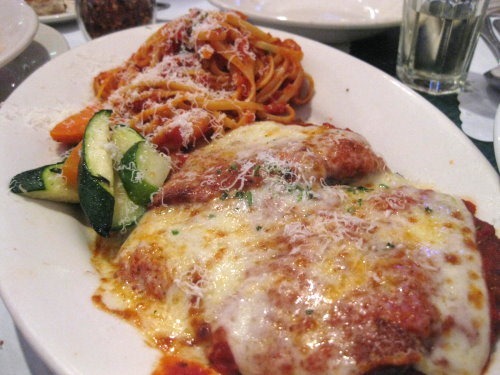 The chicken parm was another table favorite because they give you a large serving of chicken, which worked out well for our table of five. It was served with roasted vegetables and a plain side of spaghetti and marinara. Although the chicken was stellar, I was a bigger fan of the Signature Seafood Pasta. 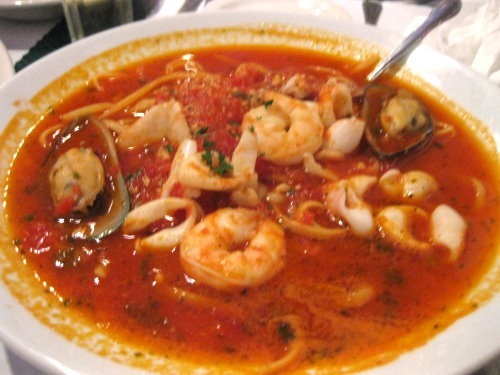 The noodles were bathed in a flavorful tomato broth and had seafood galore. I ended up eating way too much, and the fresh-baked chocolate chip cookies they brought out with the check put me over the edge. I was seriously worried I would die during the half in the morning. Obviously I didn’t, but I was that full. Part 2 with my last three days of eating coming up later! Question of the Day: What’s the best thing you ate this past weekend?